Ebens Head is a fairly prominent bald rock formation at the northwestern tip of Duck Harbor. 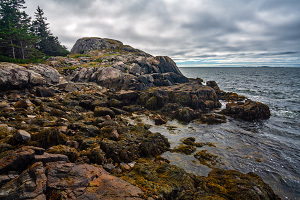 A short mile-long trail leaves the main Duck Harbor Road to traverse a cobblestone beach and several jagged rocky outcroppings to reach the highpoint of Ebens Head and the calmer waters of the harbor. 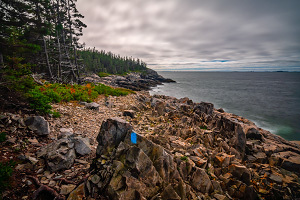 For those hiking the Duck Harbor Trail or the road from town or for those looking for a shorter hike in the Duck Harbor area, this loop is a great diversion that offers visitors easy access to some classic Isle au Haut coastline scenery. If you don't have enough time to hike the Western Head Trail, this is a nice quicker alternative. 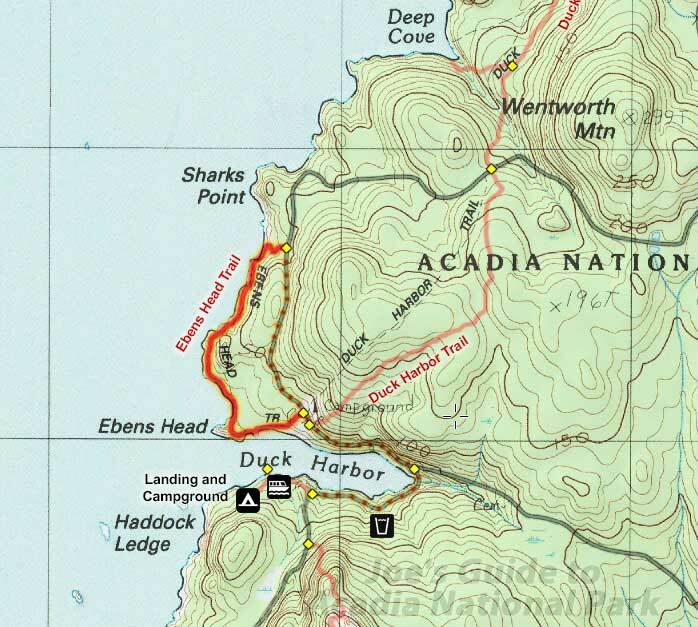 The starting points for the Ebens Head Trail are off of the main road just north of Duck Harbor. (See map below.) While you can hike the trail in either direction, it's more aesthetically pleasing to start at the northern trailhead and work your way south to Ebens Head and the more dramatic scenery. Starting from the northern trailhead, the trail leaves the road and hits the coastline right at a lovely cobblestone beach. The trail follows the coastline south, traversing many interesting rocky outcroppings and rocky beaches. While you will see a dirt trail in many sections of this hike, there is no visible trail at the cobblestone beaches, so look for large cairn markers at the far side of each beach. And while this trail is only a mile long, it will seem longer and slower due to the rugged terrain. The highpoint of the hike is Ebens Head, a bald rocky formation that you can hike to the top of to get good views of the area, including a view of the boat landing within Duck Harbor. The top of Ebens Head is often one of the windiest spots on the island. Just past Ebens Head, the trail turns east into the calmer and more protected forest along Duck Harbor. Soon enough, you join back with the road at the southern trailhead. Allow roughly 30 minutes for the hike back to the Duck Harbor boat landing. If you are doing this hike while waiting for the mailboat, pay close attention to the time so you don't miss your road off the island. While the scenery might not be as dramatic as the Western Head Trail/Cliff Trail scenery at the southwestern tip of Isle au Haut, a stroll along the Ebens Head Trail is a shorter hike that still offers up some wonderfully tranquil scenery if you have two hours to spare during your visit to the island.